High quality M.F. Blouin Sub-Surface Printed Magnetic Rate Displays. Available in a variety of wall and floor styles, sizes, and configurations. 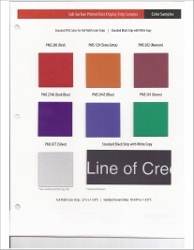 Rate Displays are printed per your custom imprint in scratch resistant, easy-to-clean Sub-Surface Printed Strips. Rate Displays are set up with all strips in place per your requirements. Standard Strip configuration listed with each Rate Display. Below is an example of the Rate Display Strip Colors availalble. 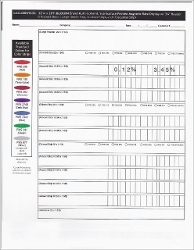 Also, below is a Rate Display Template which is available per request for filling in your custom imprint and colors. Custom Magnetic Rate Displays are available per request. Numbering needs to be added when you receive your display. Fixed "Bumper" strips, picture below, between each row maintain even strip and number alignment. Rate Displays are provided with a storage box, picture below, which includes 500 - 3/4" X 1 5/8" die-cut self-aligning sub-surface printed magnetic numbers from 0-9 and special characters (. and %). Rate Displays sold individually. Aluminum frames have removable side rail for inserting and replacing rate displays. Once the rate display is mounted, the strips are easily changeable without opening the frame. Aluminum Frame is available in Black, Silver, or Gold finish. Includes a Multi-Color Printed Magnetic Rate Display with a large 3 1/4" header from listings above. Sintra backer included for extra strength. Mounting hanger supplied with rate display. Displays sold individually. *Specify Copy when ordering. Magnetic Rate Display has additional column for Minimum Amounts. Includes large 3 1/4" header - great for logos. Black Sintra wall frame with 1" profile. Includes a Total Account Rate Display with a large 3 1/4" header. Pre-Drilled holes in back for easy wall mounting. Wall Frames come complete with mounting hardware. Combo Package sold individually. Sub-Surface Printed Replacement Strips with your copy. Strips sold individually. Full Width Sub-Surface Printed Replacement Strips with your copy. **Additional styles of Rate Boards are available, for details use Contact Us tab on our website or contact Roger Zavodny directly by e-mail at roger@myvaultllc.com or by phone at 440-346-4593.